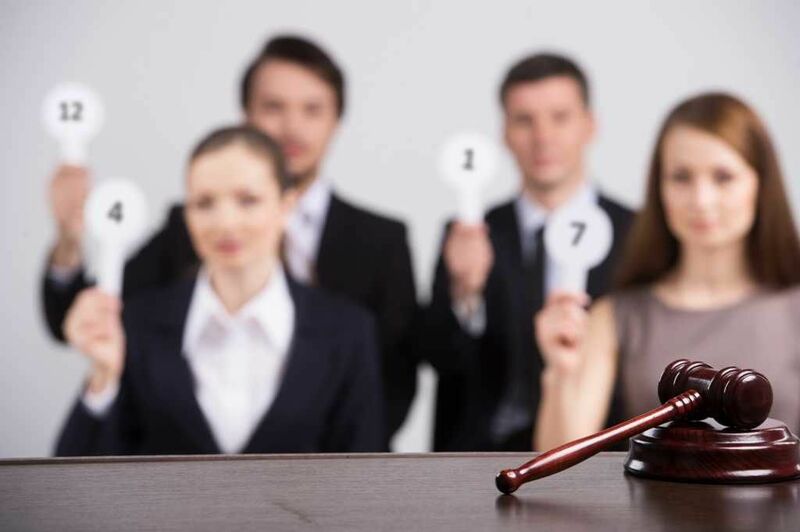 What is an English Auction? An English Auction, also referred to as an open cry ascending auction, starts by an auctioneer announcing the suggested opening bid or reserve price for the item on saleInventoryInventory is a current asset account found on the balance sheet consisting of all raw materials, work-in-progress, and finished goods that a company has accumulated. It is often deemed the most illiquid of all current assets, and thus it is excluded from the numerator in the quick ratio calculation.. The buyers with interest in the item start placing bids on the item on sale, with the auctioneer accepting higher bids as they come. The buyer with the highest bid at any time is considered the one with a standing bid, which can only be displaced by a higher bid from the floor. If there are no higher bids than the standing bid, the auctioneer announces the winner, and the item is sold to the person with the standing bid at a price equal to their bid. If the reserve price is not met or no buyer places an economically fair bid, the seller can take the item off the market. One of the unique features of an English auction is that the bidders are aware of the prices and the numbers of other bidders. At the opening of the auction, the auctioneer discloses the identity of the other bidders and the reserve price is set by the seller. The bids start at a low price and ascend up to a point when there are no more bids. A bidder not only observes the valuationsValuation MethodsWhen valuing a company as a going concern there are three main valuation methods used: DCF analysis, comparable companies, and precedent transactions. These methods of valuation are used in investment banking, equity research, private equity, corporate development, mergers & acquisitions, leveraged buyouts and finance of other people but also gets an opportunity to revise his valuation beyond the previous bids. If there is only one item for sale and each of the buyers places an independent private value on the item, the expected payments and revenueSales RevenueSales revenue is the starting point of the income statement. Sales or revenue is the money earned from the company providing its goods or services, income from the auction are theoretically equal to the Vickrey auction. A Vickrey auction is a sealed-bid auction, where each of the bidders submits a written bid, the amount of which is unknown to all the other bidders. There are several variations of the English auction. The most common variation is the English Clock Auction where the auction starts at a low price and begins to rise gradually with each bid placed by the prospective buyers. If a buyer wants to drop out of the auction, he must signal the auctioneer. A buyer who has dropped out of the bidding cannot be allowed to come back in and resume bidding. The auction ends when only one bidder is remaining, and the auctioneer announces the winner. The winning buyer pays a price equal to their current bid price. The other variation of the English auction is the time-interval auction, which is common in real estate and manuscript auctions. In a time-interval auction, the bidding may take several days or weeks but must be completed within a specified allotted period of time. One example is the eBay auction. Once a product’s been placed for sale on eBay, buyers are allowed a specific time frame within which to place their bid. The buyer with the highest bid at the close of the bidding becomes the winner and takes possession of the item after paying their current bid price. Most buyers wait until very near the end of the auction time to place a relatively high bid, in hope that no other bidder will outbid them in the limited time remaining before the auction closes. Bid jumping involves placing a bid that is above the next bid increment. The bid may jump to a price point high enough to discourage other bidders from continuing with the bidding. For example, if the bid price is proceeding from $100 to $120 to $150, the bidder may place a bid of $500. The advantage of this strategy is that the other bidders may drop out of the bidding process after being discouraged by the sudden increase in price or sensing defeat, leaving only the bid jumper. However, the bid jumper must consider the possibility that they may have paid an unnecessarily higher price in order to chase out the other bidders. In this example, the bidder may have been able to win the auction at a price of, say, $300, had they followed a normal bidding progression rather than using a jump bidding strategy. A lighthouse bidding strategy occurs when a bidder lifts his paddle up in the air and leaves it there, signaling that he is prepared to increase his bid indefinitely in order to win the auction. This is another strategy designed to discourage other bidders from continuing to bid any further because they expect the lighthouse bidder to outbid them regardless of how high a bid they make. A lighthouse bidding strategy, even though it effectively signals the bidder’s willingness to “pay any price necessary”, may actually enable him to win the auction at a lower price than he would have otherwise. For example, a bidder who may have originally been willing to bid as high as $200 may drop out of the bidding at a lower price level because he believes the lighthouse bidder will outbid him no matter how much he bids. The risk of the lighthouse bidding strategy is that a rival bidder may bid up the price to a point much higher than he is actually willing to pay, just to make the lighthouse bidder pay a very high price to win the auction. Cutting the bid means placing a bid that is less than the amount that the bidding has been proceeding with. For example, if the bid has been progressing from $100 to $150 to $200, a buyer may want to bid at $180. For this to happen, the buyer must signal the auctioneer to make his intentions known. When cutting the bid by half, the common signal is to raise the arm and hold one hand horizontally to the next with the palm facing downwards. If the auctioneer gives the go-ahead for the bid price, the buyer announces the $180 bid price and waits to see if there is a higher bid. Head nods or shakes are used to communicate to the auctioneer a bidder’s willingness to continue bidding. If an auctioneer looks at a buyer and the buyer nods his head, it means that he is still in the bidding. However, if a buyer shakes his head, it means that they are withdrawing from the bidding. In a Swedish auction, the seller of the item up for auction is free to accept or decline any bids by a buyer. It is less regulated, and the bidders are not bound by the bids they put forward. The auction originated from the Swedish real estate market. A Dutch auctionDutch AuctionA Dutch auction is a price discovery process in which the auctioneer starts with the highest asking price and lowers it until it reaches a price level where the bids received will cover the entire offer quantity. Alternatively, a Dutch auction is known as a descending price auction or a uniform price auction. is a type of price discovery process. The process works by an auctioneer beginning with the highest asking price and then continuously lowering it until all the bids received will cover the quantity offered (for sale). A Dutch auction can also be referred to as a descending price auction. This type of auction can be used in an Initial Public Offering (IPO)Initial Public Offering (IPO)An Initial Public Offering (IPO) is the first sale of stocks issued by a company to the public. Prior to an IPO, a company is considered a private company, usually with a small number of investors (founders, friends, families, and business investors such as venture capitalists or angel investors). Learn what an IPO is and is also used by governments for the pricing of financial instruments such as Treasury bills, notesCurrent DebtOn a balance sheet current debt is the portion of debt due withing a year (12 months) and is listed as a current liability and part of net working capital. Not all companies have a current debt line item, but those that do use it explicitly for loans that were incurred with a maturity of less than a year., and bondsTrading & InvestingCFI's trading & investing guides are designed as self-study resources to learn to trade at your own pace. Browse hundreds of articles on trading, investing and important topics for financial analysts to know. Learn about assets classes, bond pricing, risk and return, stocks and stock markets, ETFs, momentum, technical. A candle auction is an auction whose termination is signaled by the expiration of a candle flame. It ensures that no bidder knows the exact time the auction will end so that they can make a final winning bid. Of course, bidders in candle auctions try their best to anticipate when the candle flame will expire, aiming to enter the highest bid just before then, leaving other bidders no time to outbid them. Unlike an English auction where the price changes according to the bidders’ outcries, the bid price in a Japanese auction changes according to the auctioneer’s clock. Bidders only have the right to decide if and when to drop out of the bidding. Dutch AuctionDutch AuctionA Dutch auction is a price discovery process in which the auctioneer starts with the highest asking price and lowers it until it reaches a price level where the bids received will cover the entire offer quantity. Alternatively, a Dutch auction is known as a descending price auction or a uniform price auction. Capital Raising MarketsCapital Raising ProcessThis article is intended to provide readers with a deeper understanding of how the capital raising process works and happens in the industry today. For more information on capital raising and different types of commitments made by the underwriter, please see our underwriting overview.